Bodacious Racing LLC purchased a 1936 Ford Cabriolet, on 1/26/16, in St. Louis MO. Previous owner was an elderly couple. 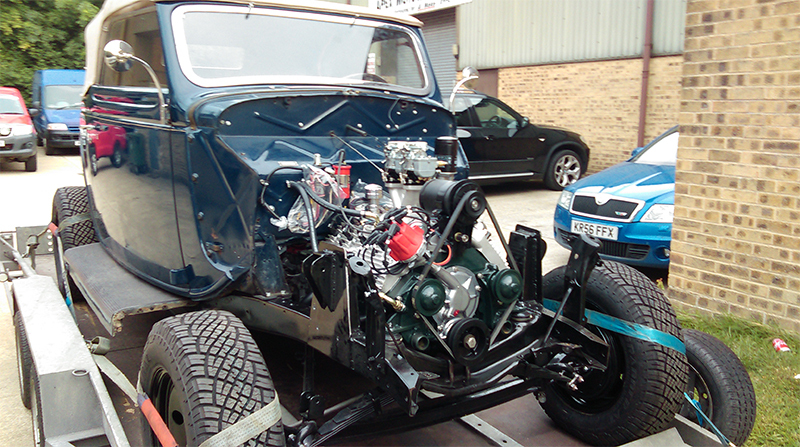 Car had never been restored but had been maintained in original condition over the years. Engine ran well, transmission worked, overdrive inoperable, original wiring was the biggest concern as the insulation was deteriorating. 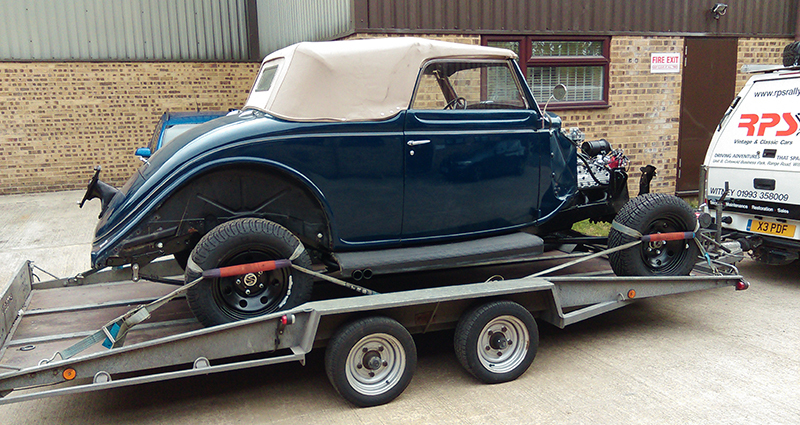 Shipped the car to UK to compete in the mid April Flying Scotsman Rally. Car cleared UK customs on 2/22/16 and was delivered to Rally Prep Services in Witney UK on March 1. No time to do anything major to the car. Asked RPS to re-wire the car, change fluids, and put new tires on the car. Then headed for Nottingham for the start of the rally and hoped for the best. Car performed very well, no mechanical issues. After the Flying Scotsman Rally, car went back to RPS for a complete rebuild into a proper endurance rally car. Engine was rebuilt and fitted with dual Stomberg carburetors. Horsepower increased from 85 to 160 hp. New rear axle, new larger brakes all the way around, changed the rear transverse leaf spring into a more modern dual fore and aft dual leaf spring suspension, chassis reinforced, 3 speed transmission changed to a 5 speed transmission, new shock towers to accommodate longer shock absorbers, all new gauge panel, Monit trip odometer, long range fuel tank, storage system to accommodate spare parts and tools and two spare wheels, larger 16" wheels, bench seat replaced with Recaro racing seats with 4 point harnesses, roll cage installed, larger radiator with electric fan, updated lights, and new exhaust system. All the new systems will be tested in the September 26-28 Alpine Trials taking place in the French and Swiss Alps. If all tests well, Bodacious Racing will purchase a second 1936 Ford Cabriolet and develop a second car with an eye towards running both cars in the Road to Mandalay and the 2019 Peking to Paris.